“Now you cannot take bath in those rivers. At least in the section of rivers that fall in our district as they are badly polluted,” he lamented. “Animal slaughterhouse dump flesh and bones of animals into these rivers. Since no one is protesting these acts, the rivers increasingly polluted by the day,” he added. Shrestha goes down to the memory lane. He used to play for hours in the rivers with his friends and still 'never get dirty'. However, his children are deprived of that pleasure because of the filth that floats in the rivers nowadays. Unlike his elders, he cannot tell them to treat the rivers with great respect and pride. “My elders taught me to revere the rivers. They would tell me that rivers are our pride and would look at these rivers it with great affection and pride. However, those values and regard for the river are gradually fading. Though we have become 'more educated', we are lacking common sense. This gradually fading common sense among people is reflected in the filth that floats in these ancient rivers,” Shrestha stated. Apart from that spirituality attached with these rivers, residents like Shrestha are also worried about health hazard and the subsequent environmental degradation. They accuse the slaughterhouses, operating rampantly nearby the rivers, for most of the degradation of the river's water and of selling unhealthy meat. “There are uncountable numbers of slaughter houses in this area. They are not only operated and managed but also produce and sell unhygienic meat products. They dump animal bones and other waste into the rivers instead of dumping such waste in a hygienic manner,” Shrestha narrated. “Let alone the long term effects such kinds of activities would bring, it is already taking toll on our health,” he added. He claimed that residents who live near the rivers and rely on them for their water supply are directly affected because of such practices. During monsoon, problems like dysentery, diarrhea and fever are getting common. Shrestha who is associated with a local youth club further accused authorities concerned of neglecting despite bringing it to their attention several times. Apart from the slaughterhouses, Shrestha accused business community in Beni Bazar of polluting the rivers. “Beni Bazar has several hotels and restaurants. They buy meat from these slaughterhouses without considering the way they are operating and polluting the rivers and our surroundings. Even the municipality office has not been able to keep them in check,” he said. Until a decade ago, such slaughterhouses were almost non-existent in the headquarters. People would grow cattle at home for meat. With the expansion of the settlement in and around the market area, demands for non-vegetarian items have increased significantly. “In lack of proper plans and monitoring of the meat supply, consumers are buying non-hygienic products. 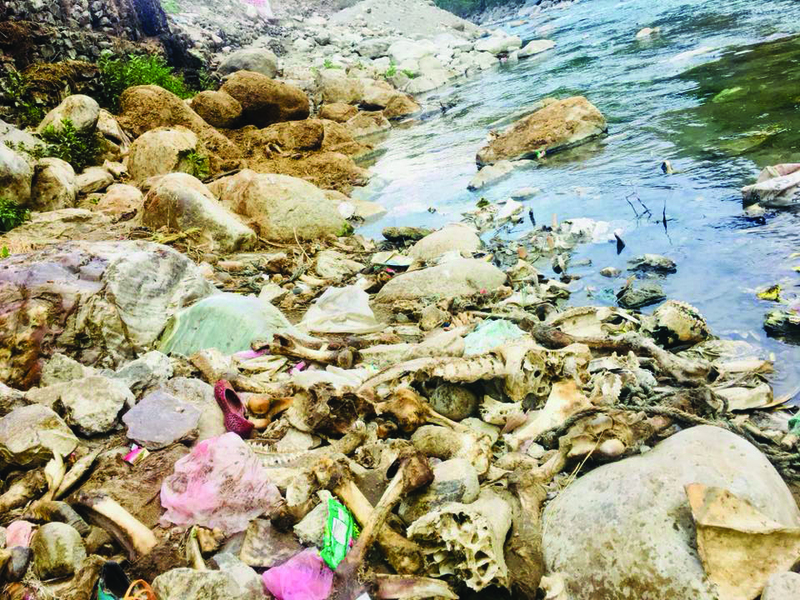 Reluctance of the slaughterhouses to find appropriate waste management solutions and adopting them is polluting our rivers,” he said further adding that such malpractice has stolen away the beauty and freshness of the rivers. “Think about the water animals and the rivers' ecosystem. The impact is beyond comprehension,” Shrestha stated. The downtown area of Beni Bazar had a very big vegetable market in the past. Expansion of the slaughterhouses over the years gradually took a toll on it. Now, the vegetable market has shifted far away from the area. While there are still small stalls of vegetable in the market area, the bigger vegetable market has shifted from there. Shrestha claims that as the meat shops in the area began to thrive, the vegetable sellers shifted to another place. Since the area started to be known for meat, he said only few people would come around to buy vegetables. But the major reason for this was lack of cleanliness among the meat shops that forced the vegetable sellers to find a better place. “Even the vegetable market was not well managed. But the waste and stench of vegetable and meat products cannot be compared. Animal waste is not only unhygienic but also intolerable for vegetarians and non-vegetarians,” he said. “The meat shops are still operating in such filthy conditions because there is a relative lack of awareness among the residents about the implications of such meat products on the health and wellbeing of their family,” he said. He further claimed that most of the slaughterhouses, slaughter animals during night to avoid being caught by police while dumping the animal waste. And since the police or authorities concerned do not patrol the river banks at night, they continue to dump such waste in the rivers, he claimed.